PACS: There’s an app for that, and radiologists are working to incorporate it into mainstream radiology workflow. 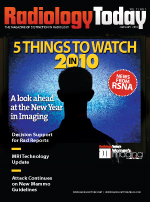 Research reported at RSNA 2009 shows that radiologists could use iPhones with the OsiriX Mobile viewer application to accurately diagnose acute appendicitis. Asim F. Choudhri, MD, presented results from a study done at the University of Virginia using iPhone 3G phones with OsiriX to interpret exams. Five radiologists reviewed CT exams of the abdomen and pelvis of 25 patients over an encrypted wireless network. In the retrospective study, the 15 patients who had acute appendicitis were correctly diagnosed on 74 of the 75 interpretations, with one false negative and no false positives. “The iPhone interpretations of the CT scans were as accurate as the interpretations viewed on the dedicated PACS workstations,” Choudhri said. In an interview with Radiology Today, Choudhri said confirming that what a radiologist sees on the iPhone matches what he or she sees on a PACS workstation is the first step toward bringing such a handheld system into routine clinical use. He noted that the related issues of patient privacy and computer security come into play only after confirming the handheld tool provides a diagnostic quality image, which was the case in this study. Choudhri, who is now a neuroradiology fellow at Johns Hopkins University, said appendicitis cases were selected because appendicitis is a common emergent medical condition often diagnosed with CT when a patient arrives in the emergency department. The iPhone can also present CT images at the full resolution acquired by the modality. If a radiologist is immediately available, the exam can be interpreted in the usual manner via the system. If not, the full DICOM images can be accessed via a radiologist’s iPhone for a quick diagnosis. Choudhri noted the exam should still be read in the normal fashion until the handheld review is further vetted, but using the phone provides an effective way to speed treatment in an emergency situation. Images can also be sent to the surgeon in this manner, providing information for planning the likely treatment. Because OsiriX Mobile is a DICOM viewer, radiologists can review and manipulate all the images in the study as they normally would instead of viewing a few static images sent as JPEG files. OsiriX is an open source DICOM viewer available through the OsiriX development Web site and several vendors. aycan Medical offers OsiriXPRO, a fully supported, FDA-approved version of the DICOM viewer. Physicians can also download and use the viewer at their own discretion, but OsiriX Mobile and OsiriX open source are not FDA approved nor is the iPhone approved for diagnostic applications. Starting down the path toward mainstream use is one reason for the appendicitis study, Choudhri said. Showing that a handheld device such as the iPhone can display diagnostic quality images is the first step. The iPhone also facilitates virtual private network connections, providing a mechanism for the encryption and security needed to meet the privacy requirements of medical information networks. CT and MRI images can be viewed at full resolution on an iPhone, but mammography and some digital x-ray images can be shown only at reduced resolution. But the potential value of a so-called handheld PACS is clear enough—for both diagnostic purposes and sharing images with referrers and patients—that vendors are increasingly adding OsiriX applications to their systems. In addition to aycan Medical’s supported PACS, CoActiv Medical showed its OsiriX capabilities at RSNA. MacPractice showed its suite of Mac-based applications for running a radiology practice, and Barco imaging showed an iPhone application designed to monitor and calibrate monitors. Handheld PACS devices aren’t meant to replace office-based systems, but like nearly every other realm of computing, smartphone applications can help access a radiologist’s expertise when he or she is outside the office.